So how can you prevent YOUR healthcare system from contributing to these statistics by falling victim to the inefficiencies and redundancies of an outdated supply chain? A Supply Chain Assessment is a recommended strategic move to elevate your supply chain and control fiscal waste. The continued consolidation of hospitals, clinics and ambulatory surgery centers into larger health systems will naturally lead to cost reduction and standardization opportunities. Without careful review and consideration, however, these opportunities will elude the bottom line and may ultimately increase costs. Action must be taken to leverage scale and the potential of an integrated supply chain. The first step in the process is to determine the scope and focus of the assessment. Figure 1 illustrates a structured data-driven approach to a supply chain assessment, followed by a detailed description of each step. System assessment. 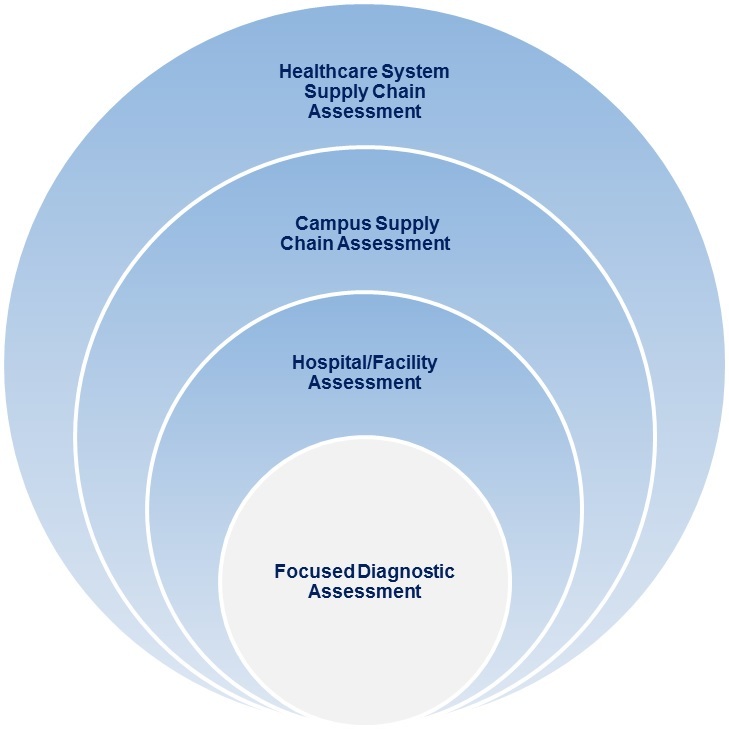 A system-level assessment focuses on the end-to-end supply chain continuum, from the point of contracting to the point of patient use. It is an opportunity for a deep-dive into the health system network to uncover significant opportunities to reduce waste. It is very easy for “siloed” decision making to drive inefficiencies across the organization. A system assessment is especially beneficial if your system has recently been involved in a merger or acquisition and dealing with the transitional issues of combining multiple systems with multiple ways of doing the same processes. Although some opportunities may be politically challenging, such as vendor performance indicators and partnerships, by leveraging them you can potentially drive significant improvements across the health system. Campus assessment. The next tier of the assessment is the campus supply chain. This investigation into campus operations includes everything from receiving to the points of care across the multi-building campus. The goal of this layer of the approach is to identify long- and short-term opportunities within your campus-wide operations and to balance coordinated wins with higher risk and return on investment. It is important at this level to understand fully whom you are benchmarking against and to be certain your entire campus is following best practices. Hospital/facility assessment. Moving on to the hospital/facility level, this layer of investigation also encompasses all processes from receiving to the points of care, but from the perspective of a single hospital or facility. Short-term opportunities that can be uncovered in this process, such as resource, clinical and vendor alignment; technology deployment; and material flow can result in quick wins and limited financial risk. Long-term opportunities can also be realized in terms of space modifications to the warehouse, dock and department supply rooms; inventory deployment strategy; staff engagement; and customer satisfaction. Diagnostic assessment. At the clinical and diagnostic level, Cardinal Health’s survey revealed, “physicians and nurses currently spend, on average, nearly 20 percent of their workweek on supply chain and inventory management.” This time could be better devoted to patient care. An even more alarming statistic to come out of that survey is that 18 percent of respondents knew of patients harmed due to a lack of necessary supplies as a direct result of supply chain deficiencies. If you recognize your healthcare facility in these claims, an assessment at the diagnostic level can help turn the numbers around. This final area of the structured supply chain assessment approach is a focused examination of department operations and material stream. As in the hospital/facility assessment, short-term opportunities in these areas can result in quick wins with minimal overall risk. Validation of the extent of the scope and approval from executive leadership is essential to the success of any assessment. As such, you must conduct a thorough vetting process at the onset of taking on an assessment. Some areas to consider including are locations (e.g., hospitals, surgery centers, urgent care centers, primary care), services (inpatient/outpatient, surgery, procedural, etc. ), functional areas (contracting, procurement, distribution, logistics, accounts payable, etc.) and systems (Enterprise Resource Planning (ERP), Materials Management Information System (MMIS), Electronic Medical Records (EMR), etc.). 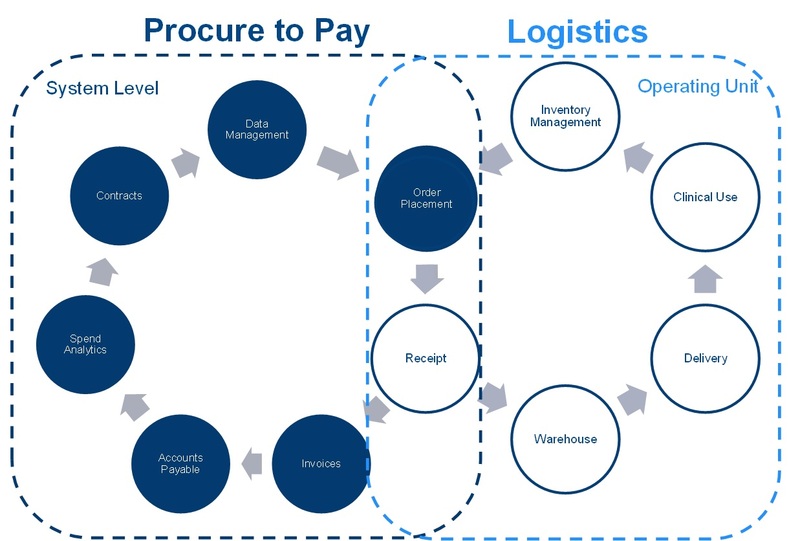 Figure 2 diagrams a sample assessment scope that shows the overlap of the system-level procurement to pay cycle with the logistics of the operating unit process. The depth of a thorough evaluation is extensive. Ultimately, the study will include interviews with department representatives from the local operating level and system supply chain, finance, systems, information technology and clinical (inpatient, surgery and procedural). A typical study requires three to five days on site at each hospital location to allow for observations and interviews, as well as opportunities to follow product from the dock to the points of care. Additionally, site visits should include a walk-along with the process owners and validation of the data relating to processes/outcomes. As this entire assessment is driven by data, site visits should also include data collection from clinical surveys, IT systems (ERP, MMIS and EMR) and observations and interviews. There are several potential obstacles to be on the lookout for when undergoing a supply chain assessment. Staff availability and support is a key factor. For one thing, do you have the resources and experience to conduct an extensive supply chain assessment on your own, or could you benefit from a consulting firm with expertise implementing a data-driven and engineered approach? While you may be intimately familiar with your particular hospital system, out-sourced experts can bring their industry-wide experience conducting such assessments and designs worldwide. As such, consultants can offer proven best practices with quantifiable results. Other obstacles to consider in terms of achieving accurate assessment results include data quality and availability. Timely input from the appropriate resources is critical to the accuracy of the data analysis and the success of the assessment. Likewise, staff knowledge of the systems and processes is also important. To make full use of the study, it is important to ensure the depth of the assessment is substantial enough to realize sufficient opportunities. Ultimately, it is important that there is a desire from the leadership and staff to act immediately on any identifiable opportunities to achieve maximum return on investment. The healthcare industry is a laggard when compared to other industries. The current consolidation climate and need for cost savings creates an opportune moment to assess and develop a strategic roadmap to develop a highly effective supply chain. It is important to get ahead of your supply chain inefficiencies before they get any worse and you become a dreaded statistic. According to the Cardinal Health survey3, 85 percent of the respondents indicated their healthcare systems are currently working toward ways to improve their supply chain expenses and inefficiencies—you are not alone. Due diligence, a data-driven assessment approach, and detailed engineering and planning based on the results of the evaluation can ensure a more effective supply chain strategy. If resources are limited, leveraging the knowledge of supply chain consultants with current, relevant, and groundbreaking experience in the dynamic healthcare industry may be the key to your system’s success. The time is now to turn the statistics in your favor. Thomas M. Redding is Managing Director, Healthcare Services, at St. Onge Company, an independent, international engineering firm based in York, Pennsylvania. His expertise includes end-to-end supply chain assessments, distribution center design and planning, inventory optimization and technology and systems evaluation and selection. His experience in supply chain assessments has enabled health care institutions around the world to realize their true potential. Thomas is an active member of several professional organizations, including the Association for Healthcare Resource and Materials Management (AHRMM); American Society of Quality, Healthcare Division (ASQ); Institute for Healthcare Improvement (IHI) and the Society of Health Systems (SHS), where he currently serves as Chair of Change Management.